Motorcycling has many risks involved, and no matter how experienced one is, the most common fear that persists in every rider’s head is the ‘fear of an accident’. Now, one can surely cut down the chances of meeting an accident by honing the riding skills. Also, staying alert with pure focus while riding is certainly one of the traits of a good rider but sometimes if you are running out of luck you can easily go down because of someone else’s fault. Most of such cases happen because of less visibility of the rider, and hence it’s always recommended to wear reflective jackets, pants and every needed accessory that makes you more visible out there on the road. One such important after-market accessory is ‘flasher lights’. What are the Hazard Flasher lights? Flasher lights are designed to give motorcycle turning indicators various blinking effects which increase visibility on the road. These flasher lights can be operated in various formats or patterns. And each pattern can be easily selected on a push of a button. How do Flasher lights make riding safer? These lights are nothing but a modified form of hazard lights (which are available in the stock form in some motorcycles). Flasher lights are designed to attract attention out there on the road. These can be deployed at times when the visibility is quite low for example during the night time or foggy conditions. 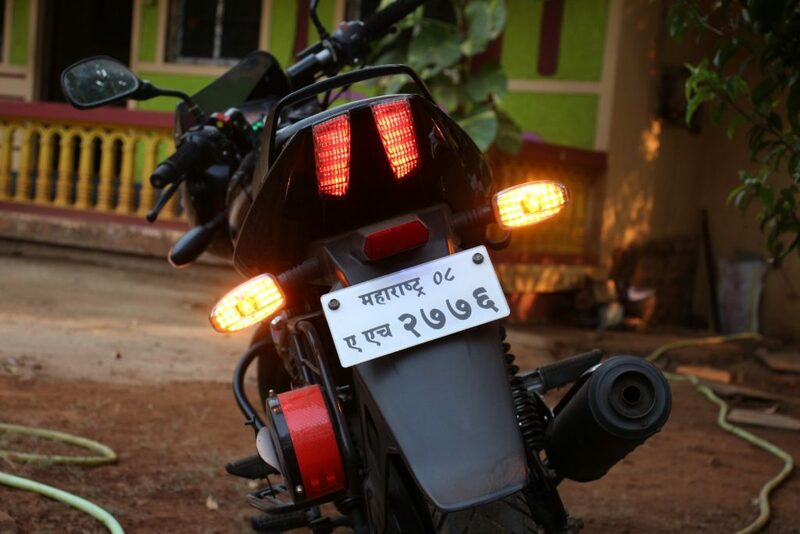 These lights can also be used when a vehicle is pulled over to the side of the road, to make the motorcycle more visible to the on-going traffic. Apart from being useful, you will also agree onto the fact that they make the motorcycle look good, especially when riding with a group and all the bikes are lit-up with flasher lights. Also, it is recommended that you use LED direction indicator lights since LED lights are much brighter compared to the traditional halogen lamp lights, also they have a much longer life cycle compared to other traditional lights. Since flasher lights change the pattern of lights and make the lamps blink much faster than usual, hence these lights are more compatible to be used with LED directional indicators. Also, make sure that you visit a certified mechanic or electric technician for easy and safe installation these lights. The PnP Hazard Flasher module available on the Grandpitstop.com is a highly recommended, easy to install flasher device which has been designed to fit in all various kinds of motorcycles, including Bajaj Pulsar models, TVS Apache models, and all Royal Enfield bikes. The module comes with various features including override feature (which simplifies the use without the constant need of on/off switch toggle for direction indicators), 1-year warranty, ready to fit mountable control switch, water resistance, and shockproof setup. Since its setup is very easy to install, there is no requirement of wire tempering, and hence warranty of the motorcycle is maintained. How Motorcycle service centers may be duping you!